“Parents, give thanks to the Lord if He has called one of your children to the consecrated life. It is to be a great honor, as it always has been, that the Lord should look upon a family and choose to invite one of its members to set out on the path of the evangelical counseled? Cherish the desire to give the Lord one of your children so that God’s love can spread in the world What fruit of conjugal love could be more beautiful than this? 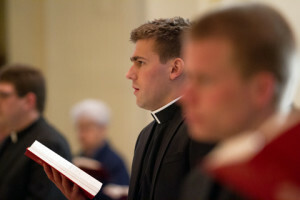 Year after year, in surveys of newly ordained priests, over half report that their families opposed the idea of priesthood when they first expressed interest. Undoubtedly, parents want the best for their children. So what about priesthood does not fit parents’ vision of “the good life”? Let’s look are six common myths about seminary and priesthood. Many parents, when their young son expresses an interest in seminary, will dispense well-meaning advice: “Get some life experience first—and at least a college degree—then think about seminary later.” Mom and dad envision that with a nice girlfriend and a good job, the idea of priesthood will fade away. This is an easy myth to dispel. Priests are surrounded by people! After all, their job is to bring Jesus to people and people to Jesus. They are continually working with parish staff, youth, and a myriad of people who come to them for spiritual advice. Seminaries today are very deliberate in teaching men how to form good, healthy relationships with people in their parishes and the priests of their dioceses. Sure, there can be lonely moments—but the same is true in any vocation, marriage included. Most priests have healthy friendships with brother priests, lay people, and family that keep them grounded and connected. Some parents think that if their son becomes a priest, they’ll never see him. One young priest laughed at this idea. “When Thanksgiving rolls around and my brothers and sisters are busy with their children and in-laws, guess what? As a priest, I don’t have any of those ties. It’s me carving the turkey with mom and dad!” His point is that diocesan priests are able to spend a healthy amount of time with family. If the priest’s assignment is far from home, in the Internet age, social media and Skype make it easy to keep in touch. The ideal Catholic parent understands a simple truth: that God desires your child’s happiness even more than you do! If your son experience a genuine call from the Lord to pursue the priesthood, trust in God’s love for your son! From the earliest years, make it clear to your children that God has a plan for them. Read them Bible stories of Jesus calling his disciples. Engage in open conversations about your children’s hopes and dreams. Make sure that they understand the various vocations to marriage, priesthood, and religious life. Above all, teach them how to pray and serve others. Sometimes, as every parent knows, children ask very insightful questions that aren’t easily answered! When this happens, look for the answer online together. That shows that you take their inquiry seriously, and that it is worthwhile to get a good answer. “…people must start praying that their own homes be the source of those vocations to the priesthood and religious life. Don’t pray in a vague way that, somehow, men out there somewhere will respond to their call. What? My Son, a Priest?